What Happens During Oral Surgery? Fixed Implant Dentures: What’s It Mean For You? Discussing implants, restorations, and more is something you do because you’re missing teeth and what you want most for yourself is to get back to a smile that you don’t have to think about and worry about throughout your daily life. You want a smile that lets you do all of the things you do with a natural smile with ease (like eating, talking…). As you learn more, you will quickly realize that when you start getting into the details of what you’d like, what you don’t really want, and more, there are a lot of options. Often a surprising amount! Today, our Santa Rosa, CA team would like to discuss fixed implant dentures, in case you’re looking for a way to address full tooth loss with exceptional stability. “But won’t I get amazing stability with dental implants no matter what?” you ask. The answer to that, of course, is yes! If you choose implants and crowns, implants with a removable denture, or fixed implant dentures, you are going to enjoy a smile that’s wiggle free. However, when we’re talking about stability within the context of assuming you’re going to enjoy denture support, there’s something to consider: You may not like the idea of taking your denture in and out. When you seek out a fixed prosthetic, you may really want that long-term daily wear. This is what you get in this case. The denture will be secured to the implant posts, so it remains in your mouth 24/7. For many patients, there are a lot of emotions that go along with experiencing tooth loss. Once you replace your teeth, you remember that you dealt with missing teeth for a while, but it’s just a distant memory. What you see in the mirror, of course, is your complete grin. For some, removable dentures provide too great a reminder every day of complete tooth loss. As a result, you may prefer to choose fixed implant dentures. You will only see your smile with all of its teeth, rather than a consistent visual reminder of your missing natural teeth. Not sure which direction to go? Speak with our oral surgeon team soon during a consultation. Take time out of your schedule for an implant consultation if you’re interested in improving your smile after tooth loss. Schedule the time you need in Santa Rosa, CA by calling Santa Rosa and Rohnert Park Oral Surgery at 707-545-4625 to schedule your visit today. 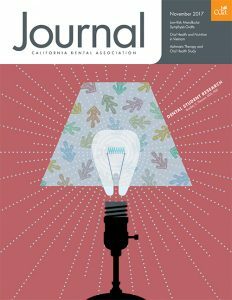 Dr. Rogers was published in CDA’s November Issue. Click above to see his article (pg.601). Yep, We Can Help You With That! Dental Sedation For Every Person And Need! • Yep, We Can Help You With That! © 2019 Santa Rosa & Rohnert Park Oral Surgery. All rights reserved.